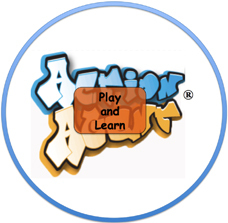 A Remarkable Learning Company: Linking game-play performance to work-process performance. PAKRA works with you to understand the knowledge, skills and behaviors critical to maximizing your customers experience, and to explore opportunities for business improvement across all channels of contact, including face-to-face, phone/voice, chat, web, email and social media (such as Twitter, Google+ Facebook and LinkedIn). PAKRA then customizes Serious Games and a SaaS platform for learning and performance management such that you manage learners applying their skills to their work processes. Fun, engaging multimedia PAKRA® Games simulate your work processes and provide a practice environment where your employees acquire critical-thinking and decision-making skills — before they engage with prospects and customers. PAKRA® Console and Analytics provide people-management tools and business intelligence to recruiters, trainers and managers. In turn, they can predict, track and manage learning ability, business process and employee performance. PAKRA clients report ROI of $77–$135 for every dollar spent. 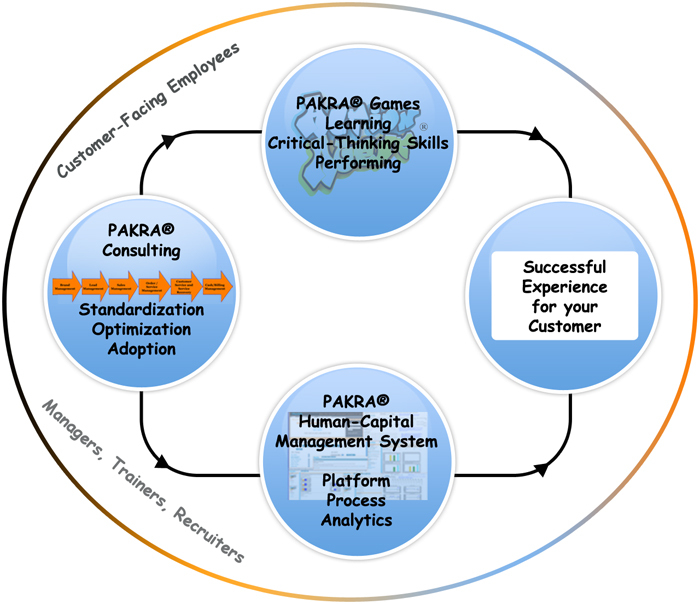 PAKRA® Games: Learn via simulated work processes before interacting with real customers. PAKRA® Human-Capital Management SaaS: Scalable, on-demand tools and real work process analytics for managers, trainers and recruiters to make targeted and informed decisions. PAKRA® Consulting Services: Leverage each channel and maximize employee learning and adoption of business process and technology. 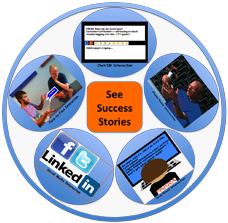 John: "I learned how important it is to tune everything from the background out, to focus solely on the customer. That is very important, as is staying calm and sympathizing with the customer to their problems that they may have." Andy: "Pretty kool game, great learning tool." Samir: "I learned how to handle some frustrated customers by staying calm and doing the best you can to help with their problem. I learned about it playing the post-hire PAKRA Game, I had a great time." Rebecca: "Sympathizing with the customer really helps keep the tone of the conversation at a manageable level. Also, the quicker you can handle the situation, the more the customer appreciates its, as long as you are resolving the issues thoroughly. Overall, I think this is a good test of knowledge and it lines up pretty fairly to what we actually are doing on the phones." Brian: "This was a very good representation of what it is to work in the call center. The calls were pretty accurate on calls an agent might receive. The major lesson I got out of this is to remain calm and to empathize with the customer on issues presented. Also the co-workers were over the top but very effective at being distracting and entertaining." Nicki: "Very educational, and realistic to a typical call center environment. Tested quality of service, ability to multi-task, and active listening. 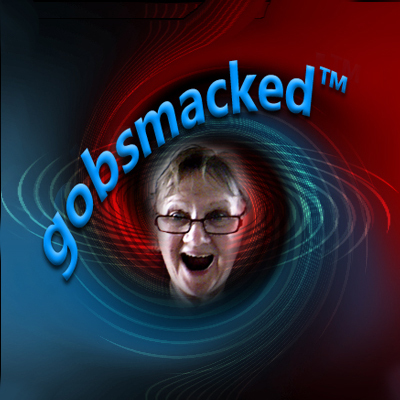 I enjoyed playing, and learned effective phrases to use on my calls when servicing my customers." KN: "I enjoyed the game because of the realistic real life situation that customers presented. The game was very interactive and fun." Chris: "I learned that there are ways to address a customer\'s concerns without getting defensive. It\'s important to not react to the customer with the same negative energy that they may come into the call with. Having the different choices really made me go through similar calls that I have encountered in my day to day work, including even calls from earlier today, and assess whether I had responded in a way that was not empathetic and see ways that I may have better reacted to certain situations. The answers also gave me some good vocabulary that I can use with the customers that I encounter. I found that you have to really deal with the emotion before you can get to the heart of solving what the customer has called to sort out. Jessica: "I thought that it was better than the computer test that I took before I was hired." Aubrey: It\'s always good to follow any statement with a question to get more information out of the prospect and get them thinking. Bart: This is very realistic! Betty: I liked it a lot. The first session made me nervous due to the fact I felt rushed making a selection. Took my time more on the second. James: I liked the realism of the situation and the fact that you had to be quick. James: I like this program. This is my second time thru. Quick responses are expected and it affects the outcome. Very interesting. Thanks for letting me play. Angel: I learned that you have to have presence of mind during a call. There will be many distractions and you have to stay focused. Eric: You must treat customer in a very courteous manner and you must know what their needs really are. Mitch: I learned that in order to communicate to the costumer well you must listen to their problems and always find the best way to help them. Accabar: I have learned that if you handle the costumer\'s concern very well they will be satisfied! Sheena: I learned a lot from this game. I now know to handle different people. Maria: I\'ve learned that an agent must be patient with the customers. One must remain calm in dealing with these kind of situations. Ester: Sometimes we meet difficult customers, but I can manage it. Mari: I learned that when dealing with customers and clients, agents must always be polite when answering questions and solving problems. Oliver: You have to be patient with customers. You have to be fast when resolving the problem of the customers. Chris: it will really help me to increase my skills in selling and convincing customer to by products.